Hamby Home(in)stead ...: The sweet (and sour) smell of success! The sweet (and sour) smell of success! After tucking the sourdough starter into the thermal cooker yesterday, I left it undisturbed near the combustion fire (which was on a lot of the day). I resisted the urge to check progress last night and instead waited till this morning - about 23 hours since preparing the starter. Success! There were quite a few bubbles and the smell was rather unpleasant, causing Nick and Vaughan to exit the kitchen area very quickly holding their noses! As funny as their loud protests were, the smell is in fact a good sign because according to Hugh Fearnley-Whittingstall fermentation is "... signalled by the appearance of bubbles on the surface and a smell of ... well, of fermentation (it can actually smell quite unpleasant and acrid at this stage but don't worry, it will mellow as it matures)." Good to know I don't stink at making starter! 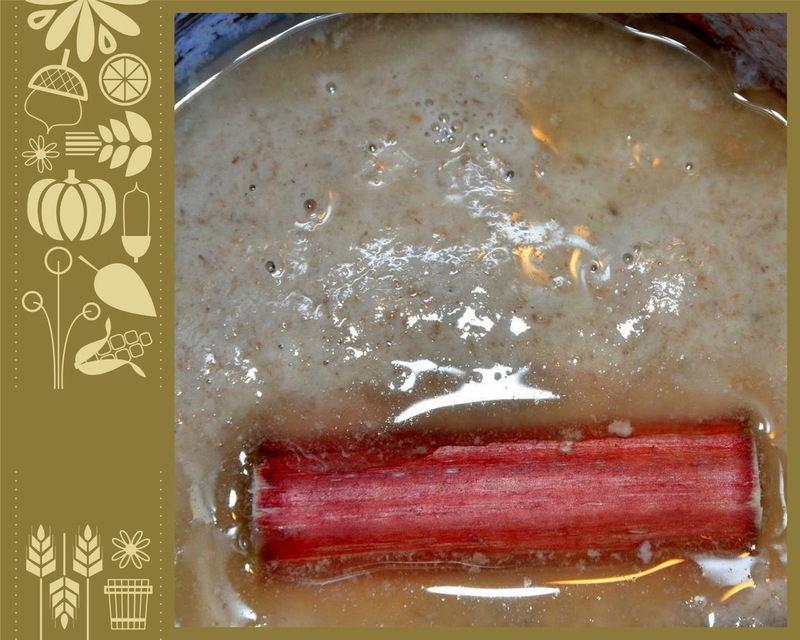 I fished the rhubarb out, fed the starter some more flour and a drizzle of water to maintain the consistency - then tucked it back into the thermal cooker. Today is warmer than yesterday so I haven't lit the fire but hopefully the starter will continue to bubble away nicely (and smell a bit sweeter when I check on it tomorrow)! Things that go chomp in the night! Fashioning the "Fox-proof Fowl Fort" (FpFF)!